With over 2.5 million visitors every year, Dollywood is, hands down, one of the most popular things to do in the Smoky Mountains. However, between the tickets, food, and souvenirs, adding a trip to an amusement park can often times be one of the most expensive activities on any vacation. According to the Gatlinburg cabin company, the easiest way for families to save money on a trip to Dollywood is to consider purchasing a season pass. Perfect for those considering multiple trips to the Pigeon Forge amusement park this year, one season pass is less than the cost of two regular price adult admissions. With a savings of over $30, there is no doubt that a season pass is a great way to save money on vacation. In addition, travelers who decide to purchase the Dollywood Gold Season Pass will also benefit from saving $10-$15 on parking at the Pigeon Forge amusement park. For non Gold Season Pass holders, Timber Tops Luxury Cabin Rentals points out that attraction-goers can take advantage of the low-cost Pigeon Forge trolley as a way to travel to Dollywood and still cut down on parking costs. Trolley stops are located along the Parkway in Pigeon Forge, and full-day passes can be purchased for only $2.50. Other money saving tips that the Gatlinburg cabin company suggests is for families and guests to check out the year-round deals that Dollywood offers. Year-round discounts to Dollywood include a $4 discount to AAA members and a 30% discount for both active and veteran military members with valid ID. Rounding out the list for the Gatlinburg cabin company on ways to save money on a trip to Dollywood, Timber Tops suggests vacationers consider staying inside one of their spacious Pigeon Forge or Gatlinburg cabin rentals. Along with breathtaking views and relaxing accommodations, guests of Timber Tops Luxury Cabin Rentals will also enjoy exclusive access to their online ticket reservation system that offers discounted tickets to many of the area’s fun and exciting attractions, including Dollywood. Established in 1996, Timber Tops Luxury Cabin Rentals is an industry leader in professional property management in the Gatlinburg, Sevierville and Pigeon Forge area. Locally owned, the staff at Timber Tops strives to provide each guest with attentive, courteous, proactive and prompt service to ensure everyone who visits one of our luxurious cabins gets the most out of their vacation. 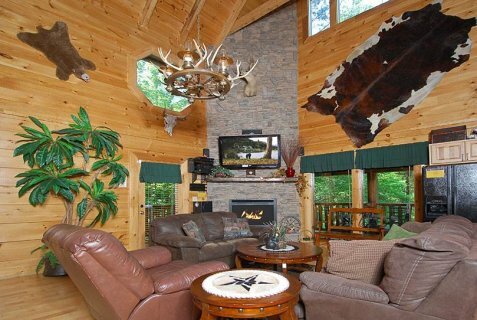 Timber Tops Luxury Cabin Rentals’ office is located at 1440 Upper Middle Creek Road, Sevierville, TN 37876. For additional information on our services, or to reserve your cabin today contact us today by calling us at 1 (800) 266-1066, by email at reservations(at)timbertops(dot)net, or visit our website at . Our office is open 24 hours a day!